News - Farrell Looks to Have Irish Eyes Smiling on July 27! Farrell Looks to Have Irish Eyes Smiling on July 27! 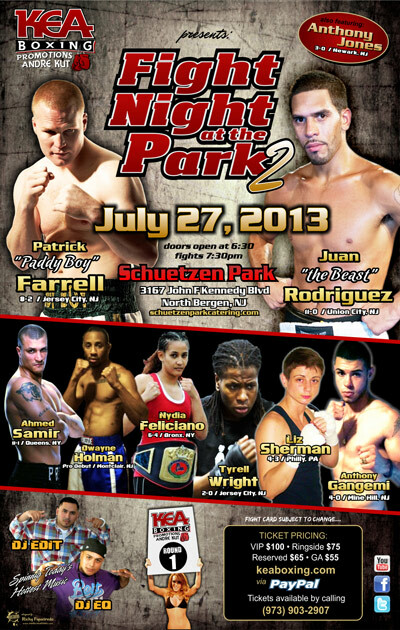 Fireman “Paddy Boy” Pat Farrell (8-2-1, 4KOs) looks to bounce back from a controversial split decision loss to John Lennox when he faces a familiar foe in Kalven Jenkins in the co-feature six round rematch on Andre Kut’s exciting KEA Boxing card at Schuetzen Park, in North Bergen, New Jersey on Saturday night July 27th.The card will be headlined by Union City, New Jersey’s Juan “The Beast” Rodriguez. Many boxers struggle with a the ability to manage both work and boxing , but it is a luxury for Farrell to have a passion and time for both full time occupations. Now the Jersey City fire fighter is prepared to a make run up the proverbial ladder and it all starts again on July 27th. Farrell has always had a passion for sports, which led him to LaSalle University, where he starred as a linebacker. Once he graduated, Farrell realized he had a passion for boxing. “I always loved boxing. Mike Skronski aka “Mickey Red” was my next door neighbor, growing up,” said Farrell. “He was Arturo Gatti’s second assistant. Mike was like a big brother to me. I hooked up with him and after six months in the gym, I told him that I wanted to fight. He said, “I tell you what, if you stay in the gym for a year, I will get you a fight. I held up my end of the bargain and he entered me into the 2007 Golden Gloves. It was my first tournament and I won it. Also in 2007, I captured the Diamond Gloves title and then again I did the same thing the year after, winning both tournaments in 2008.” The success in the amateurs had Farrell eagerly ready to turn pro and he did just that with an exciting first round TKO of Philip Hannah. Farrell reeled off five consecutive victories with a heavy handed fan friendly style that has allowed him to have a raucous and loyal fan base. “I have a huge following of rowdy and loud Jersey City Irish supporters. They are the most loyal people I have ever met in my life. They will follow me even if I fought in Tennessee. They would be there. A lot of time, I not only fight for myself, but for them also. When I come out and I hear these guys yelling: “Paddy Boy!!! Paddy Boy!! !,” It is a wonderful feeling in this sport,” commented Farrell. Farrell returned after a twenty month layoff, before capturing a hard fought unanimous decision victory over Kalven Jenkins and then reeled off two more victories before his controversial loss to John Lennox. “The two year layoff before my fight with Jenkins was because I had suffered two broken noses and went to the Fire Academy,” stated Farrell. “I had always wanted to be a fireman since I was a kid. I had originally tried to go while I was playing football at LaSalle University. I was to be captain and start at Wagner, but I wanted to take the exam. They told me that I had an obligation to LaSalle University and they would take away my scholarship money if I did. I ended up having to wait until I graduated college. I took the test to be a fireman in 2005 and I waited six years to be hired. They didn’t hire one class in six years. I was the first class they hired. In his most recent bout, Farrell suffered a controversial split decision loss to John Lennox, which many people at ringside thought went his way. Now, Patty Boy must bounce back with a rematch against five fight veteran Kalven Jenkins . “Jenkins is a tough fighter who knows how to punch. I expect another tough fight,” said Farrell. “I am familiar with his style. He is a tough customer. When I tagged him he didn’t go anywhere. I am not sure what he is going to do, but I lay it all on the line, every time that I step into the ring, so expect a terrific fight on July 27th.